Currently celebrating its 60th anniversary, Pridgeon & Clay, headquartered in Grand Rapids, MI, was launched by John Pridgeon and Donald V. Clay in a small converted garage. Under the current ownership of Donald V. Clay’s two sons, Donald C. Clay and Robert E. Clay, the company has grown into an international manufacturing showcase with facilities in several locations including Franklin, IN, and Apostag, Hungary. As it became one of the largest independent, value-added manufacturers and suppliers of stamped and fineblanked components and assemblies for the automotive industry, Pridgeon & Clay’s management, including Ross Martin, vice president of International Operations, committed to a full-time professional error-proofing program with a fully staffed error-proofing laboratory. A few years ago, Jim Taylor was selected to launch the program and currently is the error-proofing-lab team leader. Taylor, a journeyman die maker who has been with Pridgeon & Clay for 22 years, accepted the challenge of developing and implementing error-proofing technologies across the manufacturing floor. The goal was to reduce the number of manufacturing steps required to produce a quality product while implementing a serious error-proofing set of technologies within the stamping and assembly areas of the company. The program began with a serious die-protection phase and has morphed into an aggressive and effective part-quality-monitoring stage. To make the advances possible, in late 2005 the lab was assigned an assistant, Tim Ray, a toolroom die technician. Ray has mastered the die-protection aspects of the program and trains all shop floor personnel who will have contact with the sensors. His training includes a three-week course that each of the die technicians in the toolroom must attend. To further complement the team, Brent Sawdy, a controls technician, was assigned to the lab. Sawdy has mastered the application of LabView software for data collection from the measurement sensors used in-die and in offline quality-inspection devices developed and built by the lab. 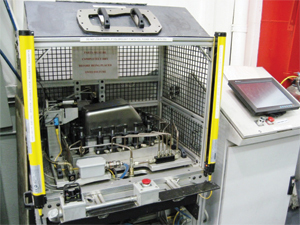 A solid example of the technical and managerial teamwork that abounds within Pridgeon & Clay is the development of an inline inspection station that was added to a two-out progressive die stamping door panels. 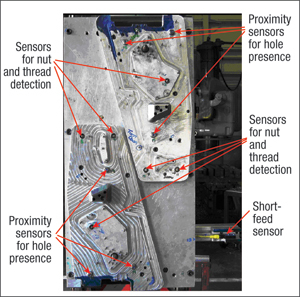 With left and right panels exiting the die, human inspectors had to check offline for hole, nut and thread presence at a rate of 100 percent. The cost for this human-based quality-verification process amounted to $45,000 per year. There had to be a better . The three members of the error-proofing lab along with key production, engineering and tooling personnel developed and built a separate additional section mounted adjacent to the end of the door panel die and bolted to the bolster. After the parts are cut off, they are transferred from the cutoff station to the inspection station using a clever adaptation of the press transfer system with shortened transfer rails and grippers. To stand in front of this panel-stamping process and watch every single part automatically checked brings smiles to the management of Pridgeon & Clay, their customers and to the team members who worked with the error-proofing lab to make this possible, including Scott Visser, Dennis Myers, Jason Boersma, Ed Brown and Bruce Wollen. The parts now are 100 percent inspected for pierced holes, and and nut and thread presence. Should one or more of these features be absent, the process stops and the bad part is prevented from entering the part-out conveyor. A second example of the application of sophisticated error-proofing techniques is the offline oil-pan flatness-checking fixture. This gauge clamps the oil pan at 16 points with a predetermined torque that simulates mounting on a vehicle. After clamping, 16 separate analog (measuring) sensors take the gasket-area flatness readings. A PC running LabView software gathers these readings and within seconds lets the operator know if the part is good or bad. The computer stores the actual measurements for traceability and further statistical and tooling correlation studies. The operator needs only to place the pan in the fixture and push one button—the rest of the process is fully automated.